Head north on Wilcox St toward 6th St. Turn right to merge onto I-25 N/US-85 N/US-87N, continue to follow I-25 N/US-87 N. Take exit 193 to merge onto Lincoln Ave. Turn right at S Oswego St. Turn left at Lioness Way. Destination will be on the right. Head west on University Ave toward Broadway St/CO-93. Turn left at Broadway St. Turn left at E Baseline Rd. Merge onto US-36 E via the ramp to Denver. Take the exit onto I-25 S toward Denver. Take exit 193 for Lincoln Ave. Continue Straight. Turn left at E Lincoln Ave. Turn right at S Oswego St. Turn left at Lioness Way. Destination will be on the right. Head northeast on Cole Blvd toward Denver W Blvd/Denver West Marriott Blvd. Turn right at Denver W Blvd/Denver West Marriott Blvd. Turn right at W Colfax Ave/US-40. Turn left at Indiana St. Turn left to merge onto US-6 E. Take the exit onto I-25 S/US-85 S/US-87 S. Continue to follow I-25 S/US-87 S. Take exit 193 for Lincoln Ave. Continue straight. Turn left at E Lincoln Ave. Turn right at S Oswego St. Turn left at Lioness Way. Destination will be on the right. Head northeast on Cherry Creek Shopping Center toward Steele St. Turn right at S Steele St. Continue on Cherry Creek N Dr. Continue straight to stay on Cherry Creek N Dr. Slight right toward CO-2/S Colorado Blvd. Slight right at CO-2/S Colorado Blvd. Merge onto I-25 S via the ramp to Colorado Springs. Take exit 193 for Lincoln Ave. Continue straight. Turn left E Lincoln Ave. Turn right at S Oswego St. Turn left at Lioness Way. Destination will be on the right. Head west on 5th Ave toward Main St. Take the 1st left onto Main St., and turn right onto CO-119/Ken Pratt Blvd.Continue to follow CO-119. Continue onto Foothills Pkwy, and continue onto Foothills Pkwy. Turn right, and our Boulder location will be on the right. 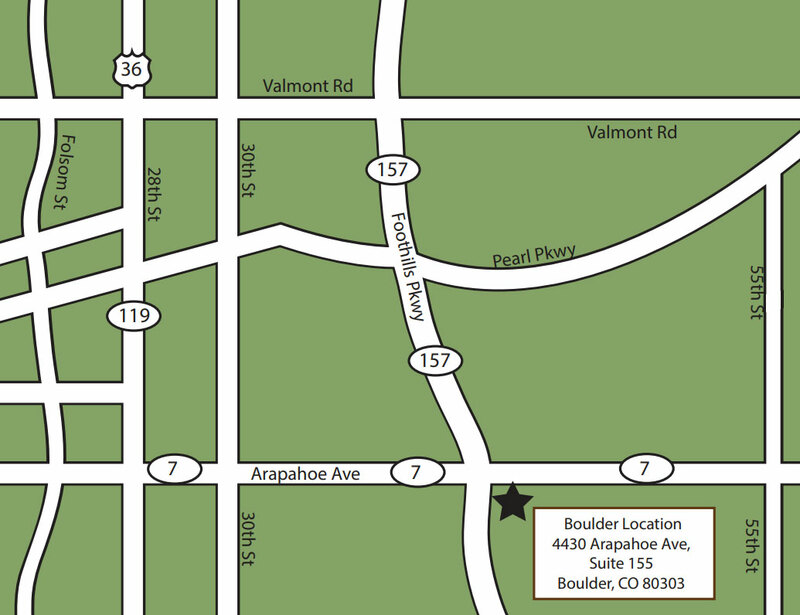 Head west on Spruce St toward Main St. Take the 1st right onto Main St., and turn left onto E South Boulder Rd. Continue onto S Boulder Rd. Take the ramp onto CO-157 N/Foothills Pkwy, and turn right onto Arapahoe Ave. Turn right, and our Boulder location will be on the right. Head southeast on 4th Ave. Take the 1St right to stay on 4th Ave., and turn right onto W 3rd Ave. Turn left onto Nickel St. Turn right onto U.S. 287 N., Keep left at the fork, follow signs for CO-121 S and merge onto CO-121 S., Take the ramp onto US-36 W., Exit onto CO-157 N/Foothills Pkwy toward Cu Stadium, and Turn right onto Arapahoe Ave. Turn, right and our Boulder location will be on the right. Head south on Sherman St toward E 13th Ave. Turn right onto E 13th Ave., and turn right onto N Speer Blvd. Slight right to merge onto I-25 N toward Ft Collins. Take exit 217A on the left to merge onto US-36 W toward Boulder. 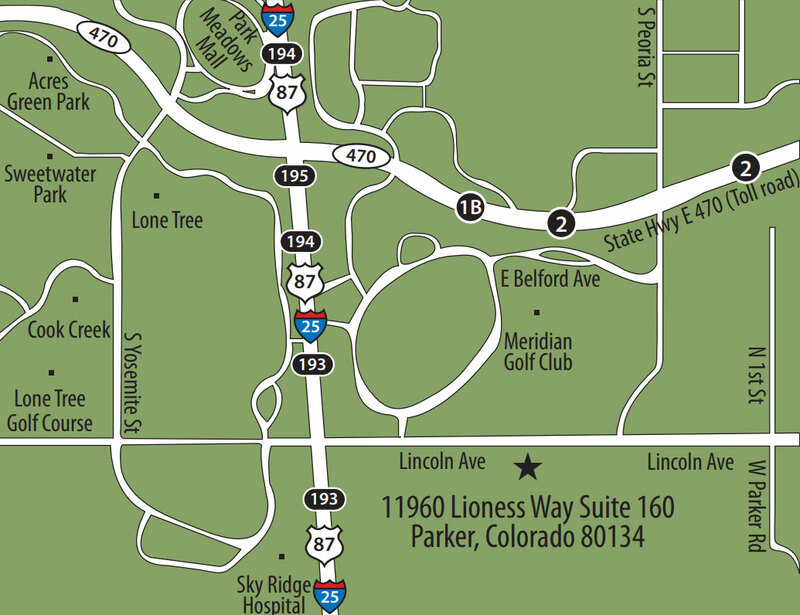 Exit onto CO-157 N/Foothills Pkwy toward Cu Stadium, and turn right onto Arapahoe Ave., Turn right, and our Boulder location will be on the right.